Both Python and Ruby are high-level server-side scripting languages primarily focused on high-performance crispier codes and widely used for developing web apps and prototypes. They are also the top preferred candidates for the best first programming language among the community. Ruby started in Japan in 1993 and the major version release in the US was in 2001, while Python was conceived in the late 1980s by Guido van Rossum and its implementation began in December 1989 with the major version release in 1995. Scripting languages have become incredibly popular over the years and not everyone is happy with a single scripting language. Python has gained significant traction in the past couple of years and Ruby has also gotten a lot of attention since the appearance of Ruby on Rails. Here is a brief head-to-head comparison between the two popular scripting languages. Python began as a pet project of Guido van Rossum in the late 1980s and officially implemented in the December 1989 at CWI in Netherlands. He started working on a new scripting language back then with the syntax similar to the ABC programming language but with improved performance to overcome the flaws of ABC. He finally introduced the first official version of the programming language in 1991 and over time, it become one of the most popular and widely used first programming languages among the community. It is a powerful, high-level programming language yet easier to learn and grasp. The power of Python is often compared to Perl but with much simpler syntax and high code readability. The best part, Python is open-source meaning anyone can modify the source code, pass on, or use the source as long as he does not preclude others from doing the same. 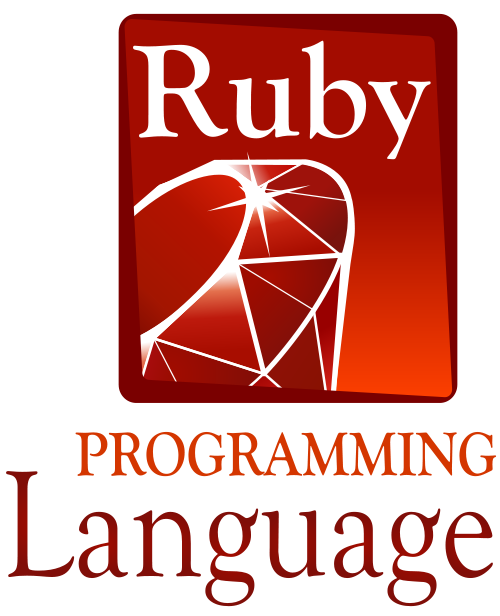 Ruby is a dynamic, high-level, object-oriented scripting language mainly used for general-purpose programming. It is a beautiful, artful language which lays focus on human-language programming and it has the potential to replace the almighty Perl. Like the motto says, “There are better ways to do it”, with Ruby there is always a myriad ways to do the same thing. It was originally designed as a tool of productivity for programmers in the mid 1990s by Yukihiro “Matz” Matsumoto in Japan. It has many features similar but more powerful than Perl, in addition to a pure object-oriented programming (OOP) language. In addition to being flexible, it’s easy to figure out. And Ruby has a killer app called Ruby on Rails – a web application framework for producing websites with databases quickly and hassle free. – While both Python and Ruby are high-level server-side scripting languages, especially first languages, and among the most popular in the community, but they have different philosophies. Both are object-oriented, dynamic programming languages. The power of Python is often compared to Perl but with much simpler syntax and high code readability, whereas Ruby has many features similar but more powerful than Perl. Python is mostly preferred for computational tasks whereas Ruby lets you do things in a myriad of ways, not just one way, so you can have it your way. – Instantiation is the process through which an object instance is created from a class. The instance variables in Ruby are strictly private meaning they can only be accessed via methods, hence the need for the method value. The instance variables define “getter” and “setter” methods to access the attributes, the former of the name of the attribute, the latter suffixed with an equality sign. Instantiation is quite less functional than in Python where a class is considered as a function that returns an object. Instead, classes are objects themselves so instance and object are used interchangeably. – Python represents all its data as objects, out of which list and dictionaries are mutable meaning they can be altered or modified after they are being created or without changing their identity. Other objects of built-in types like int, float, tuples, strings, and Unicode are immutable meaning their content cannot be modified. In Ruby, mutability is a property of an instance, not the entire class. Unlike in Python, strings are mutable in Ruby but can be changed with the freeze method. In fact, practically everything in Ruby is mutable by default and they can be modified. – Some of the most common yet popular full-stack Python frameworks are Django, Flask, web2py, Bottle, Google App Engine, TurboGears, CherryPy, and much more. All of them are popular web frameworks for writing web applications, but Django is the most popular Python web framework that helps you build high-quality web applications with minimal fuss and lets you work outside the scope of the framework as needed. Ruby on Rails is the most popular Ruby web framework written in Ruby and is often mentioned alongside other coding languages such as HTML and CSS, but it does not come in the coding language category at all. Sagar Khillar. "Difference Between Python and Ruby." DifferenceBetween.net. 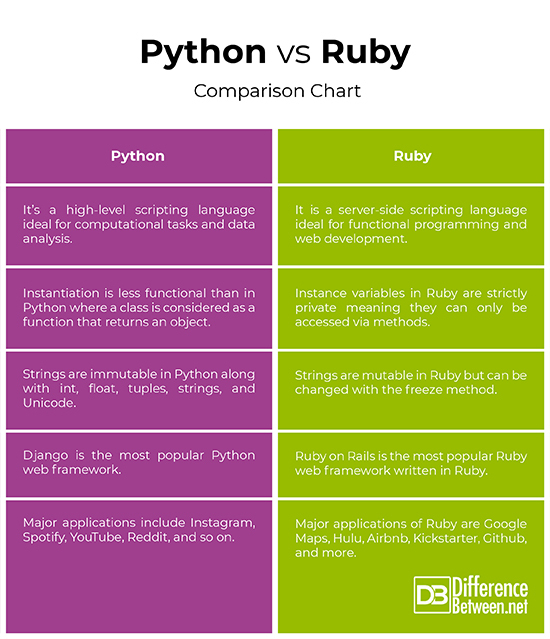 March 8, 2019 < http://www.differencebetween.net/technology/internet/difference-between-python-and-ruby/ >.